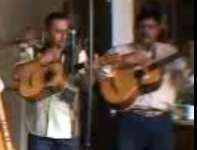 A vihuela (L) and guitarra de golpe (R) being played as part of a Mariachi orchestra. Mexican vihuela, Guitarrón mexicano, Huapanguera, Jarana huasteca, Guitar. Standard Guitarra De Golpe tuning. The Guitarra de golpe is a stringed musical instrument from Mexico. It has 5 nylon strings in 5 courses. The headstock usually has a traditional shape that is designed to look like a stylised owl. For a while during the 20th century, the Guitarra De Golpe fell into disuse in traditional Mariachi groups, and was replaced by the Classical guitar. It has now however been revived. It is still an essential part of the "conjuntos de arpa" from Michoacán. Standard Michoacán tuning: D3, G3, C4, E3, A3. Urbana Arriba tuning: G3, C4, E4, A3, D4. Urbana Abajo tuning: G3, C4, E3, A3, D4. Vihuela tuning: A3, D3, G3, B4, E3. The Guitarra de Golpe has many names. Guitarra de Golpe: Golpe is the name of the strumming pattern used for this and other Mexican instruments. Guitarra Colorada: Translates as 'red guitar'. The literal translation is "colored guitar". Quinta De Golpe: Fifth strum. Mariachera: A reference to Mariachi music.